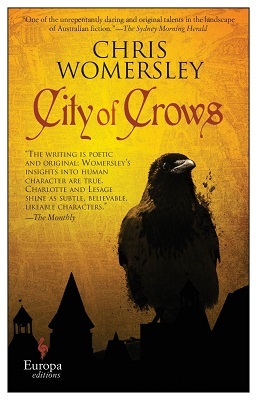 The following is from Chris Womersley's novel, City of Crows. Set in 17th century France, the novel follows Charlotte Picot, a young woman searching for her missing son. Along with quick-witted charlatan Adam Lesage, she embarks on a journey to Paris. Chris Womersley’s previous novels have won several awards, including the Ned Kelly Award and the Indie Award. His writing has appeared in Granta and The Best Australian Stories, among others. That night, when everyone was asleep, Charlotte could bear it no longer. She slipped from beneath her thin blanket and sat up for a moment to orient herself in the gloom. She patted her pocket where she kept her black book and its weight against her hip reassured her. The fire over which they had cooked soup was now merely smouldering embers. Around her the dim shapes of travellers huddled under their blankets. Marguerite and Madame Leroux were in the cart with the baby, while the men slept on the ground wrapped in blankets. The donkey stood beside the wagon with its head bowed, dozing. Overhead, through the leaves, the night sky was black, dotted here and there with pinpricks of light. Stars. The moon was low, a few days past full. No one moved. A fox cried out, an animal crept through the undergrowth. The forest went about its business. Charlotte picked her way over to where Lesage was asleep under his own bedding. She shook him until he woke, startled and wild-eyed, flailing clumsily at her. Charlotte shook him again. “Tell me,” she hissed. Finally, cursing to himself, Lesage got to his feet, scrabbled through his satchel and produced his deck of tarot cards. Squatting on the ground with his blanket draped like a cloak across his shoulders, he unwrapped the cards from their filthy scarf and held them out to her. They shone dully in the moonlight. Charlotte was fearful. She shivered in her shawl. When, at his instruction, she opened her eyes again, he arranged five cards in the shape of a cross, mumbling several incantations or curses under his breath as he did so. He had removed his hat to sleep and Charlotte could see where his hair had grown on his scalp, but patchily, like a blighted crop. His own hands were rough. His fingers were calloused and the backs of his hands were as scarred and leathered as those of a field worker. With each card he laid down, he muttered with surprise and rumination. Charlotte drew breath, as if scorched. Indeed, the cards were as beautiful and terrifying as fire. She nodded but was unable to speak. Yes, a terrible thing. A most terrible thing. The candles, their skin slackening as it fell away from the bones that supported it, the suffocating sense of inevitability when they first fell ill. Oh, oh, oh. This is how it is, how it had been, how it will always be. Prayers and a coin in their hands before they were rolled gently into their graves. A grave. No more than a hole with a dignified name. She wondered often about her son and her daughters all these years later and was glad, at least, they each had the company of their siblings. Madame Rolland, the Empress. Her crown and robes, her face looking off to one side. The card bore a colourful illustration of a man hanging upside down in a sling with his legs crossed at the knee. His breeches were blue, his shoes red and his hair a flaming yellow. She drew breath, for surely such a card was a bad omen, but Lesage sought to reassure her. She inspected the card. It showed God, or one of his angels, reaching out from red and yellow clouds with his trumpet. A naked, prayerful man and woman were standing below with their eyes cast to the heavens above. The illustration was compelling and Charlotte had to stop herself from reaching out to touch the card, as if by clasping it to her breast she might be relieved, magically, of the pain that had settled there. Oh, my son, she thought. My son, my son, my son. Tears welled in her eyes. 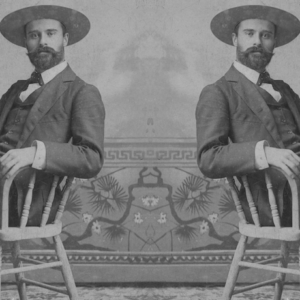 Was it better to think of Nicolas constantly, or not at all? For years she had brooded on her dead daughters and her other son, fretted over where they might be, but had her thoughts assisted them or did they merely pain them—and her—even more? Could they hear her weeping all through the night? What could it be like to listen to the longings of those who have loved you, and whom you have loved, drifting across from another realm, one impossible to visit, one barely possible to even imagine? The curé had told her—as he told all the women who lost family to plague or accident—that her children would always be in her heart (“There,” he would say, pressing a finger to his own breastbone so hard that his fingertip would redden), but this was not enough for Charlotte. She wanted her children in her arms, although she never said this aloud for fear of appearing ungrateful, or deficient in her faith. Lesage glanced at her—a little pityingly, perhaps—before looking down once more at his tarot cards. Finally, he tapped the last card, Judgement. “Yes. This one here is all about resurrection. Life eternal. God sacrificing his child to save us. You can see the Lord blowing his great horn and the dead rising from their graves to be borne aloft to heaven. All will be well, madame. This is what the card says to me. Do not worry.” He patted her arm. The following day the countryside became flatter and greener. There were many more people on the roads, and in the fields loomed giant haystacks and windmills larger than any Charlotte had seen before. There were boats on canals and flocks of birds drifting like dirty thumbprints across the cloudless sky. Villages, taverns, carts, cottages, herds of cattle, great houses shining in the distance. Women humpbacked in the fields stood upright—one hand cupped across a sweaty brow—to watch them pass. Groups of labourers squatted beside the road playing piquet on upturned barrels, a procession of monks. There were elegant ladies in carriages, travellers, merchants, beggars, lepers hovering in the shade with their clappers and bowls for coins. And corpses, sometimes, of children and old women and men, at first glimpse a skinny grey foot poking from a bundle of rags, then something bodyshaped, purple-lipped, reeking. Then, late in the day, Paris appeared. At first merely a grey smudge on the otherwise green horizon, but gradually the city resolved into buildings and spires, drifts of brown smoke and the glint of glass in the afternoon light. Black spots drifted in the grey sky over the city. Crows, Charlotte realised as they drew closer, and she slipped a hand into her dress pocket to touch her book. She soon heard the human throb of the city, smelled mud drying in the streets after a summer storm. The road became more congested. There were plenty of other carts, people on foot, shepherd boys beating their flocks to market, nobles and priests and pilgrims and thieves. They joined the procession—the saved and the damned—and passed through its gates. From City of Crows. Used with permission of Europa Editions. Copyright © 2018 by Chris Womersley.